If you buy vintage glass jewels or rhinestones, you know what I’m talking about – sometimes the foil is wonderful and adds gorgeous sparkle to your jewels. And sometimes it’s really bad, and they’re just not useable “as is”. Take a small dish or bowl (or plastic tub that used to add margarine or something). If your container has a lid that’s an extra plus – that’s just to help contain the vinegar odor, it doesn’t make any difference to the cleaning process. Leave the jewels in the vinegar solution for a couple hours, or overnight. It depends on the jewel and the maufacturer – sometimes it only needs an hour and the foil comes off like peeling a grape, a simple rub and you’re done. Sometimes it’s more stubborn, and you need to soak them overnight, and then rub or scour them a bit with your fingers. But I’ve (almost) never found jewels where this didn’t work. P.S. Save the container with the vinegar – you can use it again and again. I just added them to my Etsy jewelry supplies shop. 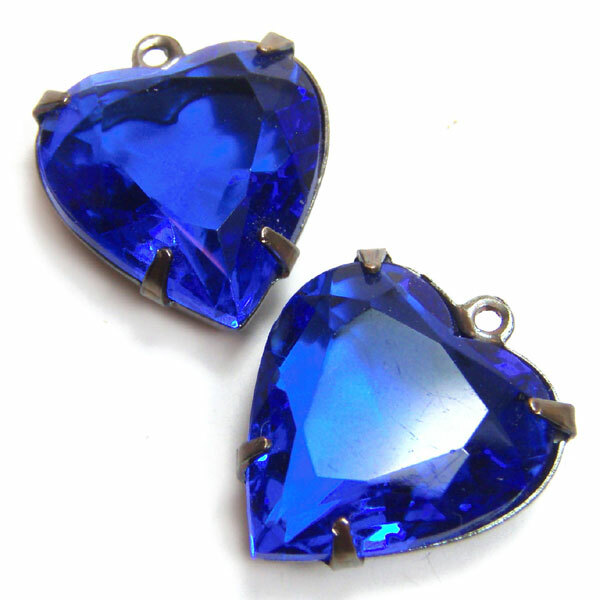 I’m always looking for rhinestone hearts – they tend to get grabbed up quickly so I was very happy to find these. 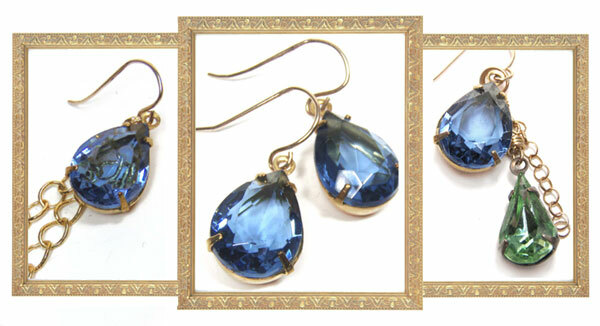 Rich and romantic and they’d make gorgeous earrings and necklace focals. If you’re in the mood for hearts, you might want to go peek! Vintage Fashion and Shopping – Gorgeous Blog! 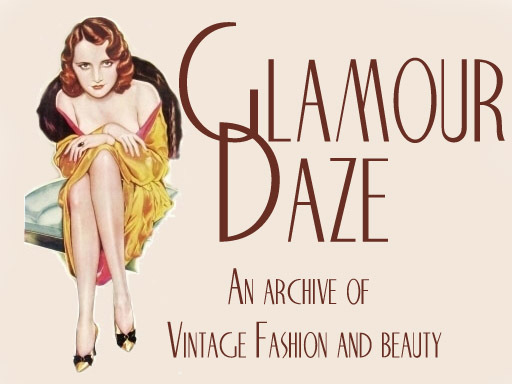 I just found a wonderful vintage fashion blog, Glamourdaze, “An Archive of Vintage Fashion and Beauty”. She’s got some wonderful pages there, talking about decades of fashion from the 1900s through the 1950s – here’s one of my favorites: Vintage Fashion – the 1930s. Check out her Vintage Fashion Store and her Youtube link to Vintage Fashion in Films”. Go have fun – and may I say, Yum! One of the fun things about making jewelry is the different styles you can design – even with (mostly) the same components. It doesn’t have to be difficult. This is not rocket science – it’s about making pretties to wear or give or sell, and having a good time while you’re at it! 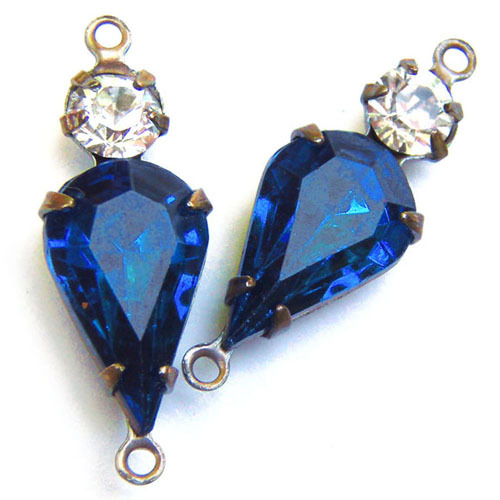 The main components are vintage rhinestone (glass) jewels – and yes, they are available here, in my Etsy shop. Of course you can use any jewels (or beads) – these are pretty ones that I had on hand. The other components? some earwires, and golden chain, and another vintage glass jewel in a similar but not identical shape, and a complementary color. None of these was difficult to execute – and they are pretty and flattering to wear. Play around with what you’ve got – try different styles – have some fun! P.S. As always – the designs here are not State Secrets – if they spur a creative idea for you, go for it! And it can be clean and simple – or, intricate and ornate. Both look good – it’s the sparkle that counts the most. And you can do it yourself. I’ll be posting tutorials from time to time for intricate creations, but sometimes simple works as well as fussy. 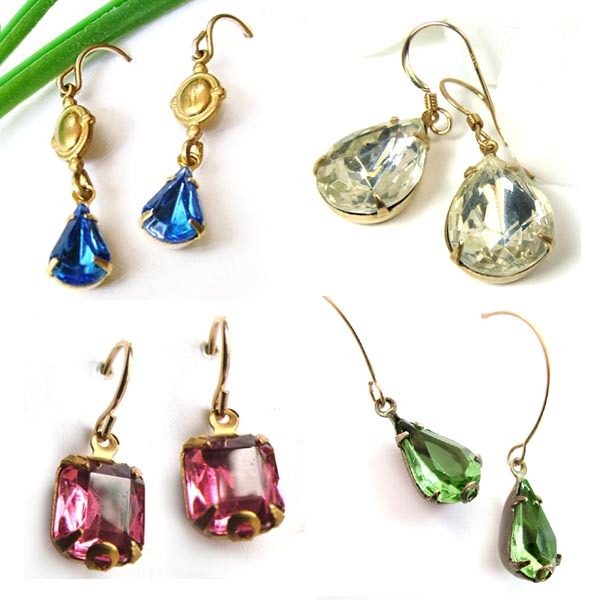 Take a look at these earrings (all styles that I’ve made myself, and certainly not original with me). They look good in the pics – they look terrific when worn. Delicate, and feminine, with just enough presence to be fun. Okay, that sounds silly, but it’s not. I got this tip from a rhinestone vendor, and once he mentioned it, it made total sense. Rhinestones are beautiful and sparkly and the precise, faceted ones are just gorgeous – take a look at these two-jewel charms, aren’t they pretty? 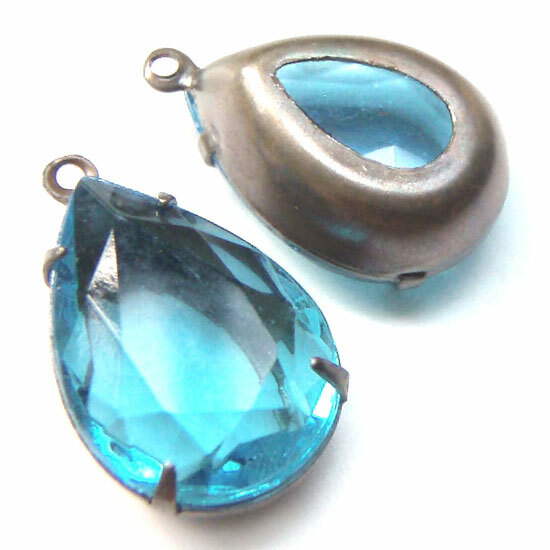 Rhinestones (and vintage glass jewels) are beautiful. Just remember to use sensible care and caution when you work with them all the time. 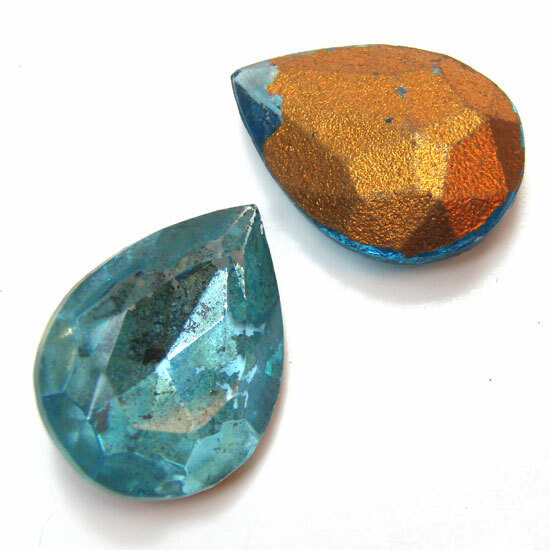 Quality rhinestones – whether Swarovski (yum! ), or vintage glass, are usually made of leaded glass or crystal. The relevant word here is “leaded”. Lead is bad for you. You don’t want to ingest it. You definitely don’t want your kids to ingest it (and please note, now and in future, that jewelry supplies are NOT TOYS. They aren’t meant for small children. They can scratch and be swallowed). But right now, we’re talking about us, the women and men who design and build jewelry. It’s easy, when you’re working with small components, and trying to do six things at once, and you really need three hands anyway, to lick your finger and pick up the pretty sparkly rhinestone, to steady it and secure it and get ready to use it. Don’t do it. Get in the habit of keeping a moistened paper or cloth towel at your workspace. When you need to moisten your finger so you can pick up that tiny little rhinestone and have it stay on your finger – touch the moist towelette. Don’t lick your finger. No, nothing terrible will happen from touching a rhinestone! Don’t get me wrong, they are not dangerous. But they come from a factory where there is dust, and the dust probably contained lead. And they contain lead. You don’t want to get any of that inside you. So – use them with love, and admire their beauty, and share them with your friends – and customers! Just clean them well, and polish them to make them even more beautiful – and stop licking your fingers.